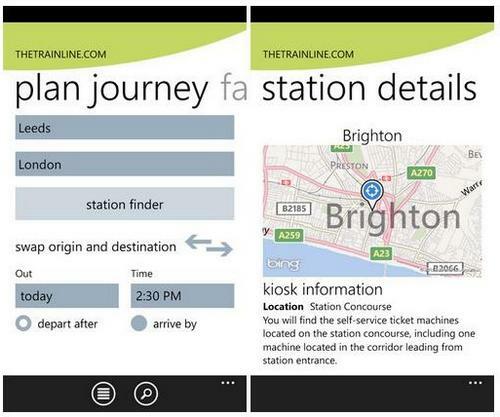 If you are in the United Kingdom and a frequent user of trains when getting out and about, and own a Windows Phone 7 smartphone there is a mobile app available that enables you to gain information on train times and cheap thicket for the first time on Windows Phone devices. The new Windows Phone app is called Thetrainline, an app that is already available on the iPhone, BlackBerry, Android, along with some Nokia devices, and comes from the United Kingdom’s leading independent train ticket retailer thetrainline.com. Thetrainline app for Windows Phone 7 devices enables the user to access info from the official National Rail timetable which is updated throughout the day, view nearby stations via list or map using the handset’s location services, view station ticket collection kiosk locations, along with seeing your ‘next train home’ whereby you are presented with the nearest station to your current location along with a list of departure times for the next trains to your home station. Thetrainline WP7 app also offers the ability to purchase cheap train tickets for your smartphone right up to 10-minutes before catching the train, and collect the tickets from over 1000 stations. With Thetrainline app users can manage bookings at any time, and view ticket collection references even without a signal. Product development director for thetrainline, Richard Rowson has said that having thetrainline app on your mobile device enables users to purchase a train ticket far more easily and quickly, with the convenience of searching and booking via their smartphone. For those that own a Windows Phone 7 smartphone and would like to take advantage of what thetrainline app for WP7 devices has to offer, you can download the application for free by hitting up the Windows Phone Marketplace.